Thurs., April 4, 2019, 6:30-8:30 p.m. The Cross presents us with a paradox that turns our world upside down. St. Paul said it well: “When I am weak, then I am strong” (2 Cor. 12:10). Join your brothers and sisters in Christ for a Lenten Evening of Reflection as we explore the meaning of these mysterious and life-changing words. How does powerlessness make us strong? How can times of suffering be times of fruitfulness? What happens when human weakness meets the power of God? The answers await us on the Cross of Jesus. 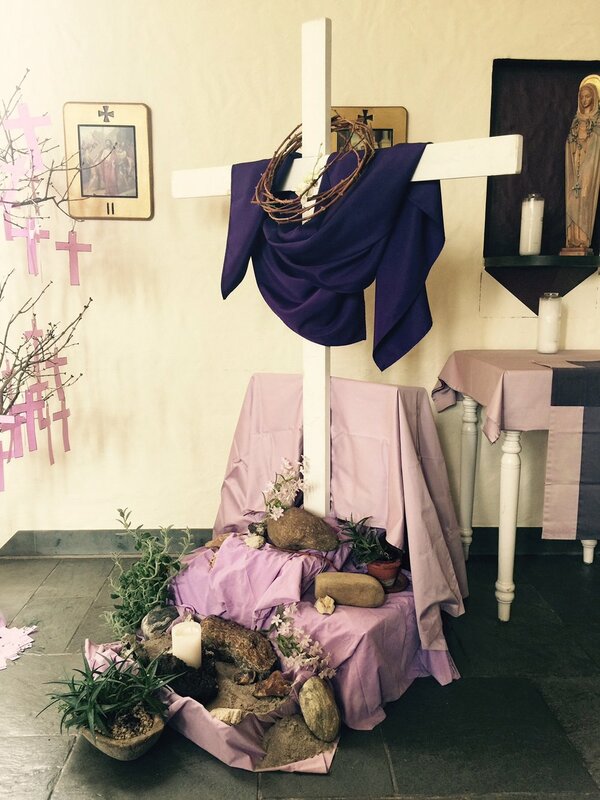 Join us for reflection, quiet prayer time and discussion as we take up our crosses and follow him this Lent. All are welcome! One-Night Lenten Mission: "At the Foot of the Cross"
March 13, 2019, 7:00 p.m. Thank you to everyone who came together to make this evening special! Sun., December 2, 2018, 5:00 p.m.
October 20, 2018, 9:00 a.m.-2:00 p.m. Presentation: "Tips and Tools for Studying the New Testament"
For the students of the Hartford Catholic Biblical School. Presentation: "Women and the Resurrection"
Sun., April 15, 2018, 1:00-3:00 p.m.
Wed., March 7, 2018, 7:00 p.m. 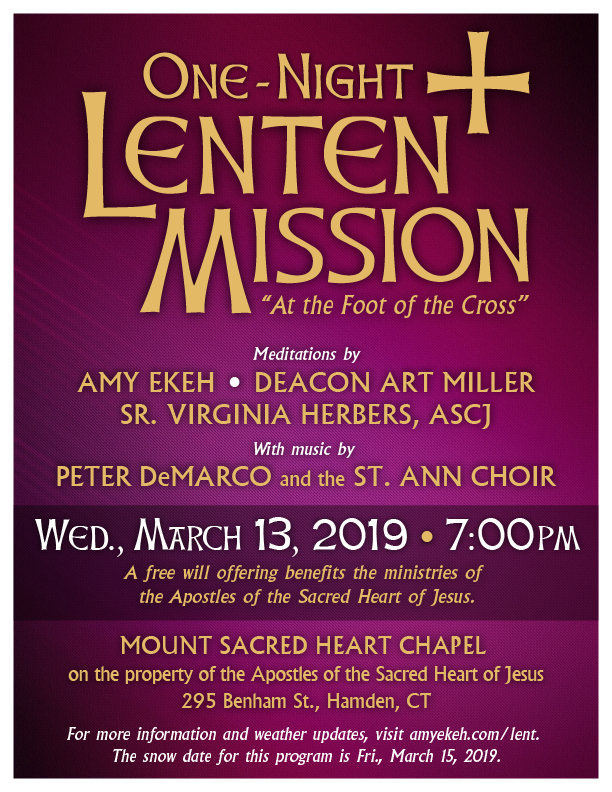 I'm joining forces with the lovely and insightful Sr. Virginia Herbers, ASCJ, and "all-fired-up" Deacon Art Miller to present a one-night Lenten Mission entitled "At the Foot of the Cross." Don't worry -- the choir is coming! Peter DeMarco will direct the St. Ann Choir of Milford, CT as we preach, pray, sing and reflect on what it means to stand at the foot of the Cross. This program will take place in the beautiful chapel of Mount Sacred Heart on the property of the Apostles of the Sacred Heart of Jesus in Hamden, CT. Please arrive early to ensure time to park and find your way into the chapel. No registration is required. A free will offering will benefit the ministries of the Apostles of the Sacred Heart of Jesus. St. Ann Catholic Church, 501 Naugatuck Ave., Milford, CT, Mon., Dec. 18, 7:00 p.m.
Join me, Peter DeMarco, and the fabulous choir at my home parish in Milford for an evening of music and meditation as we prepare our minds and hearts for the coming of Christ. A wonderful way to stay focused during the last week before Christmas. Come and be reminded that God is drawing near to us during this sacred season. The event is free and no RSVP is required. Advent Retreat: "God of Power and Smallness"
Presentation: "The Rosary of Our Lives"
Presentation: "Using Imagination in Prayer"
For the parishioners of St. Mark the Evangelist Church. Presentation: "Choosing Faith in Challenging Times"
In keeping with the parish's "Faith on Fire" theme for the year, we will reflect together on the nature of faith and what it really means to "have faith." We will then consider how faith can be the guiding force of our lives even at times when we are not sure if we believe or if we trust. And finally, we will reflect on the crucial relationship between faith, love and community. Presentation and discussion. 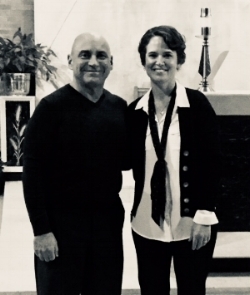 Women's Day of Reflection: "Prayer: Friendship with God"
Thank you to the gracious women of the newly formed St. John Bosco Parish for hosting me in Branford, CT. And thanks to Rose for loaning me her watch! I look forward to seeing you all again. Women's Morning of Reflection: "Pilgrimage into the Heart, The Spirituality of Catherine Doherty"
My first time to visit Enders Island was a delight thanks to the SPSA Women of Hope and this beautiful place! Lenten Day of Reflection for Women: "Finding Strength in the Weakness of my Cross"
All are invited to a Lenten evening of reflection and music at St. Ann Church in Milford. Let us come together in prayer and song to be reminded that all we need to do during Lent and Holy Week is stay close to Jesus, follow him and befriend him, and accept the extraordinary love of God he offers. 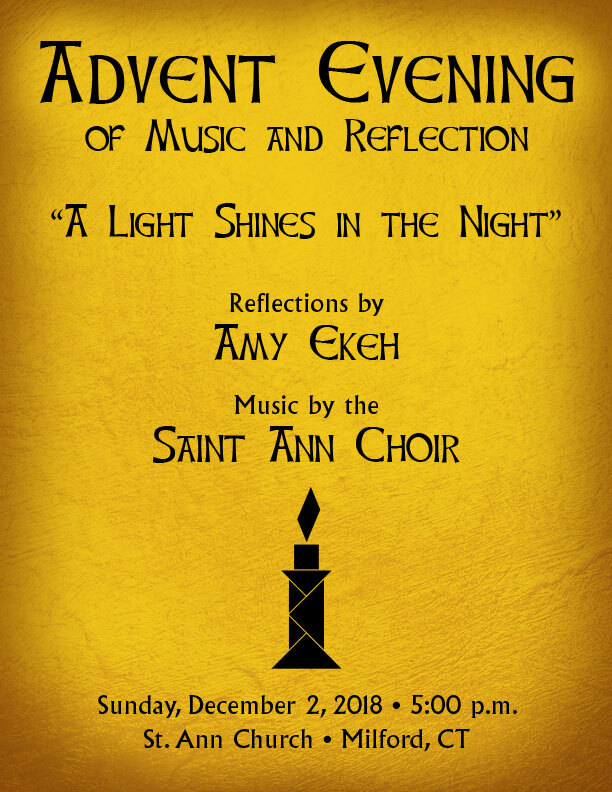 Music by the St. Ann Choir under the direction of Peter DeMarco and meditations by Amy Ekeh. There is no cost for the evening. 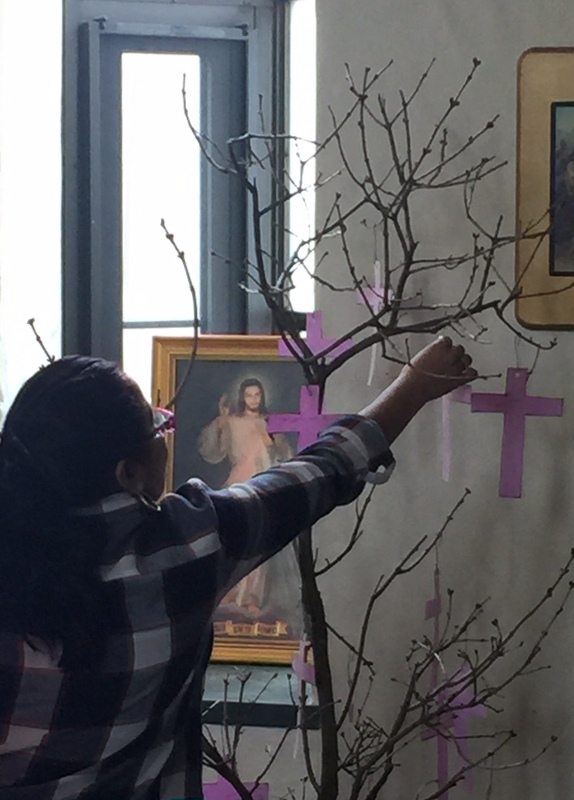 Lent Retreat at Caritas Christi Center: "Prayer: An Invitation to Friendship with God"
Prayer is our relationship with God. Like any relationship, it can be both easy and difficult, exciting and boring, fruitful and barren. Join us for a Lenten Retreat Day, as we reflect together on the meaning, purpose and challenges of prayer. We will also explore some types of prayer you may have never tried before. Each participant will receive a packet full of prayer techniques and helpful ideas. Reinvigorate your prayer life this Lenten season with a retreat day of learning, reflection, discussion and quiet time. Presentation: "Aging as a Time of Spiritual Growth: A Positive Perspective"
Have you ever thought about your later years as the greatest spiritual time in your life? While aging naturally presents us with challenges, there are ways to open our minds and hearts to new possibilities. Join us for dinner and presentation, as we consider the graces available to us in our later years. We will also reflect on our “spiritual legacies” – the spiritual blessings we want to leave behind for future generations. Presented by Amy Ekeh and Ruth Mulhern, R.N. "Finding Strength in the Weakness of my Cross"
Advent Morning of Reflection: "Reflecting on the Birth of Jesus in Scripture and in Our Lives"
Sat., Dec. 3, 2016, 9:00 a.m.-12:00 p.m. The Gospel stories of the birth of Jesus are full of powerful images, beautiful songs, ancient prophecies and rich symbolism. They are stories of joy and sorrow, peace and foreboding. The newborn king is depicted as a vulnerable infant, a glorious savior, and a potential threat to those in earthly power. He is worshipped by some and hunted down by others, foreshadowing the life and ministry that will set the earth ablaze. Join us for an Advent Day of Reflection as we reflect on these ancient stories and prepare together for the birth of Christ. Sophomore Retreat: "Pearls of Great Price"
For the sophomores of Sacred Heart Academy, Hamden, CT.
Little Rock Scripture Study Weekend Retreat: "Mercy: What God Gives and What God Requires"
Many thanks to Cackie Upchurch and the wonderful staff of Little Rock Scripture Study for hosting me in a beautiful setting among some wonderful, faith-filled people who love Scripture. I had a lovely weekend with all of you! Behold, how good and pleasant it is when Texans and Arkansans dwell together in unity! Women's Day of Reflection: "The Empty Cabin of My Heart"
Join us for a Day of Reflection as we explore the spirituality of Servant of God Catherine Doherty, a Russian-born aristocrat who fled Russia as an impoverished refugee, rebuilt her life as a successful lecturer in North America, and then voluntarily gave it all up to serve the poor in the inner cities of Toronto and Harlem. Behind every decision, challenge, joy and sorrow of Catherine’s life was a down-to-earth spirituality and a beautiful approach to prayer. In our retreat day of prayer, presentations, quiet time, discussion and fellowship, together we will discover the gift of Catherine’s life and spirituality, especially her understanding of the poustinia of the heart – a way to be with Jesus even in the midst of our busy, everyday lives. Parish Morning of Reflection: "The Rosary of Our Lives"
Thurs., May 19, 2016, 9:00 a.m. - 12 p.m.
"From Creation to the Cross: Exploring Biblical Perspectives on the Mystery of Human Suffering"
The diversity of ideas and perspectives we discover in Scripture includes a variety of approaches to human suffering. From the self-inflicted wounds of Adam and Eve to the redemptive wounds of Christ, Scripture opens to us an inner world of human questions and enduring truths. Together we will explore the lasting impact of sin, the agonizing search for answers, the challenge of authentic surrender, and at the heart of it all, the abiding love of God. Join us for an informative, thought-provoking and personally meaningful day of study and reflection as we investigate biblical perspectives on the mystery of human suffering. Sat., April 30, 2016, 9:00 a.m. - 12:00 p.m.
Evening of Reflection: "The Spiritual Adventure of Our Later Years"
Have you ever thought about your later years as the greatest spiritual time in your life? While aging naturally presents us with challenges, there are ways to open our minds and hearts to new possibilities. Join us for an Evening of Reflection as we consider the graces available to us in our later years. We will also reflect on our “spiritual legacies” – the spiritual blessings we want to leave behind for future generations. Mon., April 11, 2016, 7:00-9:00 p.m.
Lenten Morning of Reflection for Women: "Mercy"
"MERCY: What God Gives and What God Requires"
Join us for a Lenten Retreat in this Year of Mercy as we reflect together on what Scripture teaches us about the mercy of God. We will reflect on Old Testament concepts such as creation and covenant, and even consider the difficult story of Noah and the Great Flood. In the New Testament, we will consider how Jesus reveals the fullness of God’s mercy in his life and in his death, and how he calls us to a very high standard of imitating him. Our day will include talks, quiet time, prayer, discussion and lunch. Come and be refreshed in the mercy of God. Walk away compelled to live a life of mercy for others. February 20, 2016, 9:30 a.m. - 3:00 p.m. Morning of Reflection: "The Spiritual Adventure of Our Later Years"
Have you ever thought about your later years as the greatest spiritual time in your life? While aging naturally presents us with challenges, there are ways to open our minds and hearts to new possibilities. Join us for a Morning of Reflection as we consider the graces available to us in our later years. We will also reflect on our “spiritual legacies” – the spiritual blessings we want to leave behind for future generations. Thurs., Jan. 28, 2016, 10:00 a.m. - 12:00 p.m. Adult Faith Formation Series: "Catholicism 101: Encountering Christ in Prayer, Scripture and the Mass"
To register, email me at amyekeh@outlook.com, and I will sign you up. This 5-week class was designed for parents of religious education students at St. Ann's Church in Black Rock but is open to anyone who wishes to attend. Topics will include prayer basics, Scripture basics and Eucharist basics. Fr. Peter Lynch will give an instructive walk-through of the Mass on Jan. 26. "You Shall Name Him Jesus: Reflecting on the Birth of Christ in Scripture and in Our Lives"
I loved gathering with old friends and meeting new ones as we studied and reflected together on the Infancy Narratives of Matthew's and Luke's Gospels. "Pearls of Great Price: Created. Loved. Called." I enjoyed a new adventure -- leading a retreat for sophomores at Sacred Heart Academy with the help of Sr. Lany Jo Smith. Picture below: 130 pearls of great price! Day of Reflection for the Deacons' Wives of the Archdiocese of Hartford: "Contemporary Women of God"
It is always a pleasure to spend a day with the deacons' wives of the Archdiocese. We enjoyed reflecting on the lives of Catherine Doherty, Dorothy Day, Mother Teresa and St. Josephine Bakhita -- and our own call to holiness in the "nitty-gritty of life." We were blessed with a beautiful fall day and a lovely setting at St. Joan of Arc Church in Hamden, CT.
Have you ever thought of your later years as the greatest spiritual time in your life? While aging naturally presents us with challenges, there are ways to open our minds and hearts to new possibilities. Join us for a Morning of Reflection as we consider the graces available to us in our later years. We will also reflect on our “spiritual legacies” – the spiritual blessings we want to leave behind for future generations. Thurs., Oct. 8, 2015, 10 a.m.-12 p.m.
"Catholic Women Standing Strong for Today's Church" Conference: "In the Company of Faithful Women"
7:30 a.m. (Mass) - 2:00 p.m. I will speak in the morning about the life and spirituality of Servant of God Catherine Doherty. Panelist: "Biblical Understanding of Marriage and Family"
June 13, 2015, 1:00-5:00 p.m.
"The Rosary of Our Lives"
Sat., May 30, 2015, 8:15 a.m. - 2:30 p.m.
Over 100 women from throughout the Diocese of Bridgeport gathered on a beautiful spring day at St. Margaret Shrine! We had a lovely day together and enjoyed the beauty of this unique shrine. Women's Morning of Reflection: "The Rosary of Our Lives"
Sat., May 2, 2015, 8:00 a.m. - 12 p.m. I enjoyed this Morning of Reflection with the welcoming women of St. Mary's Church in Simsbury. I look forward to returning next year! Presentation: "The Joy of the Gospel: An Evening with Pope Francis"
Pope Francis’ document Evangelii Gaudium (“The Joy of the Gospel”) shares his vision for the future of our Church in the contemporary world. This presentation will introduce the document, exploring its key themes and making it relevant for every Catholic. Pope Francis writes, “I dream of a….missionary impulse capable of transforming everything.” How will you share in this transformation? How will you live the joy of the Gospel for others? Come and explore this landmark document and walk away speaking the words of St. Paul: “Woe to me if I do not proclaim the Gospel!” (1 Cor. 9:16). Workshops: "Communicating the Faith to Adults" and "How to Give a Prayer Workshop at Your Parish"
It was an honor and a pleasure to gather with the deacons of Bridgeport and their wives! Lenten Retreat: "Finding Strength in the Weakness of my Cross"
Lenten Parish Mission: "Finding Strength in the Weakness of my Cross"
Despite the icy weather, some brave souls (including myself and my daughter Siobhan!) gathered together to reflect on a Christian perspective on suffering and to meditate on the Cross, the centerpiece of our faith. We enjoyed visiting Maryland! Witness Talk: "What Christmas Means to Me: Promise & Fulfillment"
I was so blessed to join with my sisters in faith at St. James, my home parish. One of the women, Linda, decorated the Christmas tree in the chapel with red balls and white doilies to reflect the "Paradise Tree" tradition described in my blog post "Lessons of the Trees #5: O Tannenbaum!" What a beautiful, meaningful surprise. Here is a picture of the beautiful tree. Marian Day of Reflection: "The Rosary of Our Lives"
I thank the Ladies Guild of St. Mary's Church for inviting me to offer this retreat at their parish. I felt very welcome, and we had a lovely Advent day together pondering the lives of Jesus and Mary! Presentation: "Pope Francis and the Renewal of Catholicism"
I enjoyed visiting Fr. Matera's parish in lovely Simsbury, CT. Parishioners were welcoming, asked great questions and shared their own insights and ideas. You can view the presentation here: http://www.stmarysimsbury.org/news/pope-francis-and-the-renewal-of-catholicism. Workshop: "The Agony in the Garden as a Model of Human Suffering"
I shared in some meaningful time with two responsive groups at St. Paul High School in Bristol. Thanks for being willing to sit through an hour of "agony" with me! Evening of Reflection: "Your Spiritual Family Tree"
Pope Francis wrote that "the believer is essentially one who remembers." Our faith is passed on from one person to another like a living memory. Who passed the faith on to you? Who has nurtured you spiritually? Join us for an evening of reflection, prayer and discussion as we reflect back on our lives and identify the many members of our spiritual family trees. A prayerful preparation for the Thanksgiving holiday. I enjoyed reflecting on our "spiritual pasts" with a lovely group in Hamden! Day of Reflection: "The Rosary of Our Lives"
A beautiful fall day retreating with the wives of deacons of the Archdiocese. Thank you for having me! I enjoyed the day with the delightful women of Tuckahoe! Evening of Reflection: "The Rosary of Our Lives"
Wed., May 21, 2014, 7:00-9:00 p.m.
We had a nice turnout at the retreat center of the Apostles of the Sacred Heart of Jesus at Mt. Sacred Heart in Hamden. I enjoyed sharing an evening with a reflective, responsive group! Afternoon of Reflection: "The Divine Mercy"
I shared a lovely afternoon with parishioners of St. Margaret Shrine as well as some guests from other parishes. We reflected on what the Scriptures tell us about the merciful love of God and the mercy God requires of his people. We closed with the Divine Mercy Chaplet and Benediction. Women's Retreat: "The Rosary of Our Lives"
Sat., Mar. 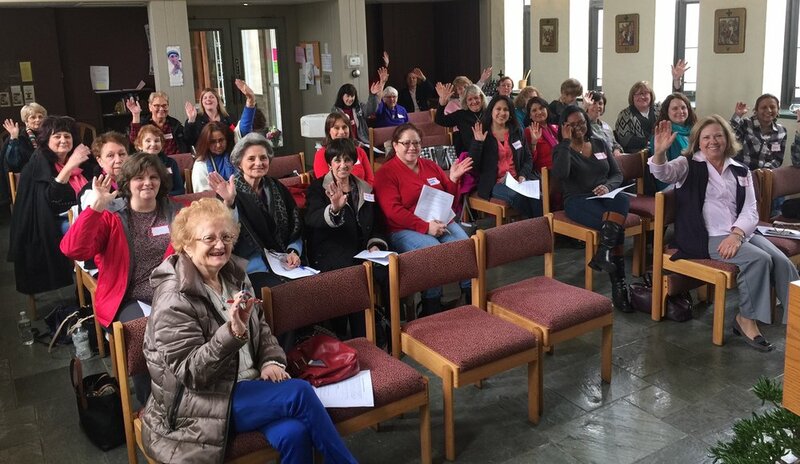 29, 2014, 8:00 a.m.-2:00 p.m.
A wonderful turnout of women dedicated to deepening their relationship with God this Lent. I was blessed by this time with the ladies of my home parish. Presentation: "Eucharist: Presence and Communion"
Feb. 17, 2014, 7:00-8:30 p.m. I had a delightful time in Windsor-Locks with the people and priests of St. Mary's & St. Robert's Churches. Thank you for having me! Presentation: "The Communion of Saints"
It was wonderful to see a vibrant "Generations of Faith" program in action! Thank you Lou Ann and Sheila. And thank you to my delightful dinner companions! Sun., Nov. 24, 2013, 2:30-3:30 p.m. It was comforting to be with all of you and witness your love for Jesus in the Eucharist. "If Today You Hear His Voice: Recognizing the Moments of Your Own Evangelization"
It was an honor to be part of this event. Sr. Julie, thank you for your support! It's always a joy to gather with my friends in Christ!